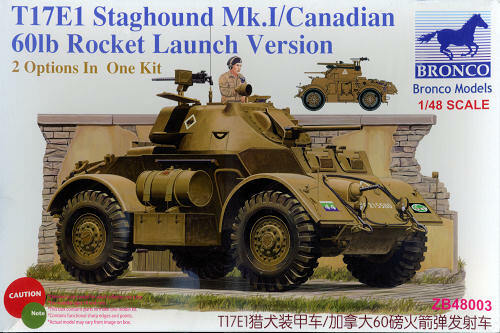 The Staghound was part of a US Army 1940 requirement that included light, medium and heavy armored cars. The war in the desert was getting the most attention so the emphasis was on speed and range. For the medium category, there were several designs submitted and several requests for prototypes. The weeding out brought things down to two; Ford's T17 Deerhound and Cheverolet's T17E Staghound. Thanks to the unreliability of the Ford, the Chevrolet version was chosen as the winner. However, the Army was having a real re-think about things and decided that they didn't really want a medium or even heavy armored car, instead going for the M8 Greyhound, a light armored car. These were not lightweights with the medium class weighing in at about 14 tons. However, the British were very interested and put in an order for several thousand of them. In fact, aside from a few handfuls of Staghounds kept in the US for testing, the entire production run went overseas. By the time these reached the front lines in 1943, the war in the desert was over and so was the real need for a fast moving, long range, somewhat heavy armored car. Those units in Italy who first got the Staghound spent little time using it as designed, as most of the fighting was over rugged mountainous terrain, an area not suited for the Staghound. When the chance for open running was provided, as in later in the war in Italy and during the Normandy breakout in France, the Staghound did superbly. The British didn't particularly like it as it was so large, going with the Dingo in most cases. This meant that Commonwealth units were those that made the most use of it. In fact, the Canadians were particularly attracted to it as it required so little in the way of maintenance. According to records, the time to get one up and running in the morning was about 10-15 minutes, while daily maintenance on the Dingo was in the 1-3 hour range. Postwar the Staghound was used by many Allied nations and found use in many other places around the world including Israel, Cuba and Nicaragua. 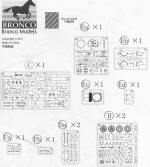 For their initial foray into 1/48 military vehicles, Bronco has chosen the Staghound, which, in my opinion, one of the better looking armored cars developed during WWII. This is the third boxing they have done, with each one being a different version from the others. Once you pry open the kit box, you find the usual superbly molded tan plastic that Bronco has been using for several years. There are six plastic sprues of various sizes with one of them being clear plastic. The sprue with suspension bits and wheels has been duplicated and sprues are in separate bags to keep bits from breaking away or getting broken during shipment. The kit also includes a photo etch fret for some bits and a section of line. One does not get shorted in terms of parts as this is not a Tamiya quick build kit. Some of the pieces are quite small, so care will need to be taken during construction. The main hull is built up from a floor section, two sides, front and rear piece. This is a curb side with no interior, though the space is there for the aftermarket folks. The suspension is actually quite detailed and the tires/wheels come in halves. These are held on by polycaps so once you have the wheels in place to assure alignment, you can pop them off again until after painting. The kit provides many options in terms of hatches open or closed, but since nothing is inside, you will want to keep these closed. The kit does come with a full gun and you will be able to see the breech with the turret hatches open. There is room for figures in the hatches should you wish to install one from an aftermarket set. What differentiates this from the other kits is the turret, being the original one that looks like something designed in the US instead of the British looking version in the Mk. III. Another bonus in this kit is that you can build the Canadian version that includes the rocket rails as used in late 1944 and early 1945. These were standard RAF aircraft type rails and rockets, which were also fitted to some Sherman tanks. They were extremely effective bunker busters. Instructions are well done with a variety of paint brands in the color chart. The paper for these instructions are not the usual slick paper of some kits, but more like what one gets with Revell AG kits. Markings are for two very similar vehicles, though no unit information is provided for either one. The British one is without the rockets while the Canadian one is equipped with them. Both of them are in US Olive Drab. The small decal sheet is well printed and provides what few markings these vehicles used. Those who like to model in the smaller scales will be delighted with this one. It should make into an outstanding model for your display shelves. My thanks to www.dragonmodelsusa.com for the preview kit. Get yours today at your local retailer or on-line store. Thanks to If you would like your product reviewed fairly and fairly quickly, please contact the editor or see other details in the Note toContributors.